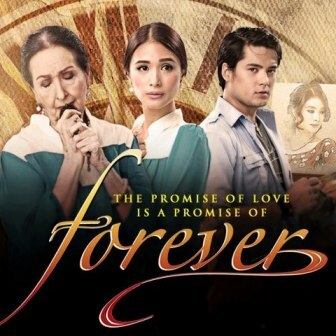 'Forever' Starring Heart Evangelista and Geoff Eigenmann Premieres Strongly with High Ratings! The much awaited premiere of GMA Network’s latest drama series FOREVER topbilled by Heart Evangelista, Geoff Eigenmann and Ms Gloria Romero debuted with high TV ratings on its pilot episode yesterday, January 21. According to the more widely recognized TV ratings data supplier Nielsen TV Audience Measurement (based on overnight data), Forever posted a Mega Manila household rating of 15.3 percent against its counterpart program Aryana which garnered 14.8 percent. Forever, which is another original creation of the GMA Entertainment TV Group, is directed by Ricky Davao. It is an original concept by Jun Lana with Headwriter Kit Villanueva- Langit. Geoff, on the other hand, is happy with his newest TV project as his character Ramon falls in love with the rich Adora. He promises to love her forever after he was killed by Federico (Marc Abaya) in 1950s Quezon. Joining Heart, Geoff and Ms Gloria in Forever are Isabel Oli, Saab Magalona, Gian Magdangal, and Candy Pangilinan. The special guests include Marc Abaya and Ronnie Henares. Expect more compelling revelations and exciting twists as the drama continues in FOREVER weekdays before 24 Oras on GMA.